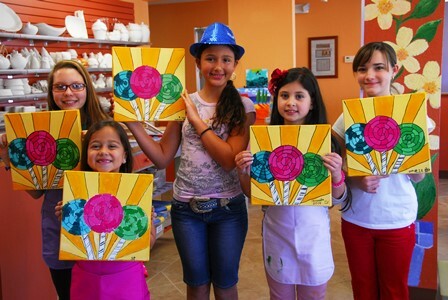 We offer a wide variety of party packages starting at $15.00 per artist. The price depends on the medium and project selected. Each party includes a staff artist, two hours in our studio and we help you with the setup and cleanup. A $50 deposit is required when booking the party and is non-refundable. However, the $50 deposit goes towards the medium you choose for your party. We do not have a large party area, so we require parties to be drop-off only. If a bigger area is requested, we will accommodate to the best of our abilities. Call the studio, 352-789-6670, to speak to a party specialist about reserving your party today. Here is a fun pARTy invite for you to use once you have booked your event!